Sita: one wonders if this mythological personality is even remotely relevant to the Modern Indian Woman. The attendance to this session, however, cleared all doubts. As the panelists on stage hailed Sita as the new, or rather age-old, poster girl for single-moms, it was hard to disagree. Yatindra, despite being the only male panelist, vehemently rallied in support of Sita to the point where assumed gender differences on Ram’s treatment of Sita dissolved effortlessly. Not once did he try to drive Ram’s agenda. Rather, he was a paragon of Sita support, especially when using examples to portray how the people of Ayodhya revere her. Yatindra’s past six generations have lived in Ayodhya and his anecdotes about life in Ayodhya and the snippets he read in Awadhi were as entertaining as they were eye-opening. He was the main Hindi-speaking panelist and described the 6,000 temples in Ayodhya alone, out of which most are Ram-Sita temples. In Ayodhya, much to the surprise of people who blame its people for being anti-Sita, Sita puja is customarily performed before paying homage to Rama. Yatindra pointed out that in Vaishnavite culture, the woman is always revered first. It’s Lakshmi-Narayana; Radhe-Krishna and Siya-Ram. What has now becomes Jai Sri Ram was originally Jai Siya Ram. You cannot reach Ram without Sita in Ayodhya. After acknowledging the atrocities Sita suffered, Yatindra also did justice to Rama by describing his self-inflicted suffering to feel one with his beloved wife banished to the Jungle by the people of Ayodhya. As per Bhavabhuti’s description of Rama, he slept on the floor despite having a rose-bed; ate little despite having food cooked by the best chefs; just so he could also feel Sita’s suffering. But Sita was also failed by Rama, the ruler, rather than Rama, the husband. As per the Awadhi Yatindra recited, Sita did not want to convey the news of Luv and Kush’s birth to Rama due to the hurt she by Rama, the ruler’s betrayal. He gave heed to gossip rather than directly questioning Sita. Sita’s dubious origins were next on the menu. Aravindan’s Malayalam film Kanchanasita, where Sita is invisible and in the elements, reflects Sita’s identity as the fertility Goddess. Arshia, on the other hand, reasoned that the male is the hero and foucus of an epic. Questions about the origins of a supporting, female character are of little importance. Yatindra, however, contended that while Sita’s origins may not be given enough importance she was revered in her own right by the people of Ayodhya, the birthplace of the epic. Sita’s pau-puja is an important tradition there. In fact, she is the vehicle who conveys a devotee’s message to Rama. Her mannerisms are what devotees adopt, as seen in the sindhoor application rituals, to reach or please Rama. A different take on Sita’s apparent submissiveness astutely pointed out that while she may submit to patriarchy, Sita’s actions are actually subversive. Sita clearly had a mind of her own and exhibited it in the way she led her life. Verses from Sita like, “Dharma is not black and white, but actually subtle” and her imploring Rama to not bring weapons into the forest because it would attract violence into his life display capacity for profound thought. While this depth can be attributed to her being a goddess, her worry as a wife and a woman display her humanity. Comparisons were drawn between Ahalya, Sita and Surpanakha-the virtues of all three women came under the scanner. While Surpanakha probably deserved scrutiny for asserting her sexuality unabashedly, which was unheard of at the time, Sita just suffered based on the doubts of people. Judging women based on their assertion of sexuality seems like an immortal phenomenon, which brought us to other very popular comparisons between Draupadi and Sita. Perhaps Draupadi is far more relatable for the “Modern Indian woman. Yatindra brought to the fore Dr. Ram Manhohar Lohiya’s essay on the same topic of comparing Draupadi and Sita where Lohiya selects Draupadi as the better character, the woman of greater substance for raising her voice and wanting revenge for the wrong-doings against her. 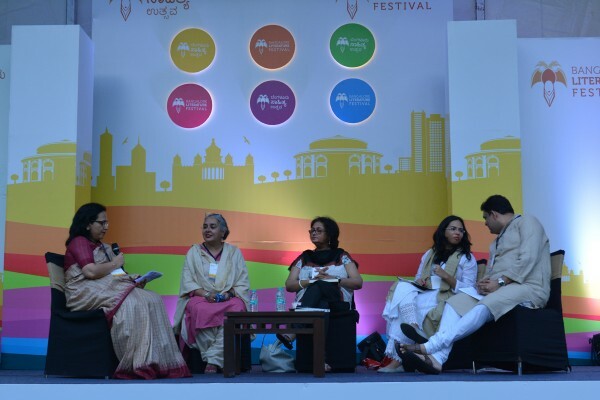 The women on the panel observed that the Ramayana talks about how to deal with women whereas the Mahabharata focuses on how to deal with men. Namita found Sita to epitomize loyalty and duty and prefers to concentrate on her positive points like loyalty and duty. Sita’s silence,however, is not something she’d like to absorb. Samhita contributed folkloric interpretations of Sita. Tribals have always depicted Sita as a strong character and not the weepy, sloppy damsel in distress the mainstream Ramayana portrays. In Basohli paintings, Rama, Sita and Lakshmana are all depicted as warriors. The strong dhanurdhari Sita is a far cry from Valmiki’s demure, helpless Sita waiting to be rescued. Arshita, whose Sita infatuation begun 10-15 years ago, when she re-read her own Sanskrit translation of the Ramayana, had more neutral inputs on Sita’s impositions upon the behavioral mannerisms and expectations attributed to Indian women. She provided unifying summaries and conclusions to the panel’s arguments. The takeaway from the captivating discussion was that though Sita’s silence problematizes her in the modern context, she cannot be dismissed as irrelevant. The actions she took in her silence can be interpreted as exercises of choice which today’s Indian women can still appreciate. From deciding to be a single mother to refusing to go back to Rama when he begged her to, she clearly had the courage to break societal norms. I left the session with just one question: Moderator, Madhavi, suggested Sita never sought revenge despite the hardships she suffered. Couldn’t one, however, interpret Sita’s refusal to return to Rama, while knowing very well how much he loved her, be seen as her final win through vengeance? From the attendance and the engagement of the attendees, it was clear that Sita continues to pack a punch, even today.